I keep entertaining the idea of “retiring” from all of this recipe-writing nonsense, but food52 keeps luring me back in. So I wrote a recipe. Sort of. It’s imprecise and adaptable, and it’s for a dish I absolutely love making when I can get my hands on impeccably fresh burrata. Gilding the lily? Guilty as charged. Click here for my recipe. oh my — we just got broccoli raab in our guerilla CSA box tonight. I think I know what I’m making. 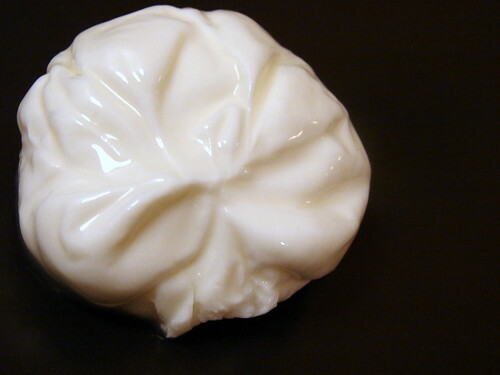 Burrata has to be my favorite food discovery of 2010. I thought, “can this be “REAL? then ordered the heck out of it at my favorite Italian place. Love your interpretation, Jen! We get very reasonably priced burrata at Berkeley Bowl. 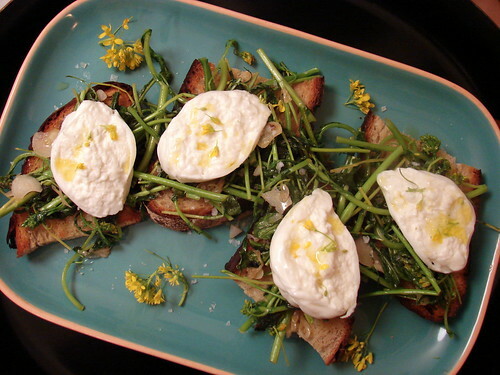 We also like a simple preparation (which we have had at COCO500): grilled bread with watercress,burrata, a drizzle of great olive oil, cracked pepper and a sprinkling of sea salt. That’s it. Super simple and divine. I’m probably the only food blogger left who hasn’t had burrata yet. Looks wonderful, though! I haven’t tasted burrata either. Judging by your lovely photos, I’m missing out. Thanks, Betty, I knew that but I was in a rush to get the post up and didn’t spend time on a grammar check. I’ve fixed it now.